Note 1: At the end of the film, the credits list dozens of US court cases defending the rights of Americans to freedom of speech, religious liberty, etc., saying that these cases inspired the film. Note 2: According to www.imdb.com, this film had a 2 million dollar budget (very small for a motion picture). It earned almost five times that much on it’s opening weekend in theaters. *”in the trenches”: this refers to a front-line soldier who is in the most dangerous part of a battlefield, and by analogy, people with a difficult job who are making a difference. 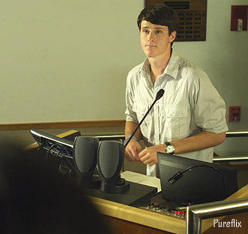 Synopsis: Freshman university student Josh Wheaton attends an “Introduction to Philosophy” class, where the uncompromising Professor Radisson asks all students to submit a signed statement that “God is dead” so that he can skip a discussion about God’s existence and teach only the work of atheist philosophers. 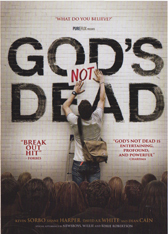 When Josh refuses due to his own Christian beliefs, the Professor challenges him to defend his position that his God is real–which leads to a series of confrontational presentations between himself and the professor. The class is “the jury” which will decide if Josh’s presentations deserve a passing grade. The stakes are high for Josh, for he risks his relationship with his girlfriend and parents, as well as scorn from classmates who are assigned extra readings because Josh refuses to go along with the majority. The professor is also a brilliant man, intent to make this young student look bad in his class, and he even promises to destroy Josh’s academic plans (to attend law school). Josh’s fellow Christian girlfriend (among others) urges him not to throw away his future with this meaningless action of defiance. But Josh feels deeply that this is something that God wants him to do. One of the main ideas in Josh’s presentation is that God gives us all free will. Therefore, Josh’s goal is not to convince everyone to believe what he believes, but to empower people to make an intelligent, free choice. The professor, and people who belong to a “religion” (including some parts of Christianity), want to pressure or demean people into believing what they believe. Josh wants people to hear the truth and make up their own minds. (A) If you were Josh, and you heard a lecture like this on the first day of class, what would you have done, and why? (D) Also talk about the interaction between Martin and his father. (F) Talk about the relationship between Josh and his girlfriend (of six years). If you had been one of them, what might you have done differently? 1. Freshman Registration Advisor: You might want to think about a different instructor. Advisor: Let’s just say you’re wandering into the snake pit. I’d recommend Patel or maybe Mueller. Josh Wheaton: Come on, man, it can’t be that bad. Advisor: It’s your funeral. Last drop date is the 22nd; you might want to keep that in mind. 2. Prof: This semester, I propose that we refuse to waste our limited time together debating the existence of “the big man in the sky,” the myth of a benevolent, all-powerful, supernatural being. God is dead. This is, of course, a metaphor, but an illustrative one, meaning not that God has somehow died, but rather that he never existed in the first place, other than in the depths of our forebears’ imaginations. He was a useful fairy tale in ages gone by, when his fiery anger was used to explain away plagues and crop failures, diseases and disasters, which we now ascribe to bacteria and viruses, chromosomal disorders and plate tectonics. In short, science and reason have supplanted superstition, and we are all the better for it. 3. Kara: You don’t want to deny your faith. I get it. So, the answer’s simple: drop the class. Josh: Yeah, but I’m not sure I can do that. I feel like God wants someone to defend him. Kara: So, you’re gonna risk our future over your yearbook quote? …Josh, I love you, but I absolutely forbid you to go up against this professor in his own classroom. We have too much at stake. The whole thing’s rigged to make you look like an idiot, and if you want to get into law school, you can’t afford to flunk this class. Amy: You’ve made a fortune selling devices that are designed to lure water fowl to their deaths. [Willie says the company has done well; “Life is good”] What makes you think you have the moral right to go around maiming and killing innocent animals? Willie: Hey, look. Let’s just get one thing straight. I ain’t maiming nothing. Whatever I see and I aim at, I shoot. When I shoot it, I kill it and then I eat it. Amy: …So this isn’t an act. You’re actually proud of what you do? Willie: Of course I am. Why would I do it if I’m not proud of it? Amy: …So what do you say to people who are offended by your show, not just because of the hunting, but because you openly pray to Jesus in every episode? Willie: Hey, we’re not trying to offend anybody, alright? If they don’t want to watch the show, they can turn the channel. As far as my praying to Jesus, my life and my whole eternity belongs to God. All this stuff is temporary: the money, fame, success. Even life is temporary. Jesus? That’s eternal. Jesus said: “Whoever acknowledges me before men, he will acknowledge before the Father in heaven. Whoever disowns me, I’ll disown him to the Father.” Now, those words are written in red [in the Bible] so they’re important. 6. Pastor Dave (in the church, Josh is sitting in a pew, when the pastor walks in): Waiting for someone? Josh Wheaton: Yeah, you could say that. It looks like He’s out at the moment. Pastor Dave: Well, maybe that’s why He sent me. Josh Wheaton: I could drop the class, run away, pretend like it never happened, which is what my girlfriend wants. I could sign the paper saying something I don’t believe. Or I commit academic suicide in front of a live audience by trying to prove that God exists. Pastor Dave: How many people in that class? Pastor Dave: And how many of them do you think would ever step foot in here, or any other church for matter? Pastor Dave: So, your acceptance of this challenge, if you decide to accept it, may be the only meaningful exposure to God and Jesus they’ll ever have. Josh Wheaton: What, that’s it? That’s all? Josh Wheaton: It can’t be that simple. Pastor Dave: Sure it can. You’re here because that still small voice inside you isn’t happy with the choices everyone else wants you to make. Personally, I think it’s the Holy Spirit talking to you. That’s how He interacts with us if we allow him to. All you have to do is decide whether or not you’re willing to listen. It’s not easy, but it’s simple. 7. Dr. Stevens [to Amy, because her phone keeps ringing as he tries to tell this busy woman that she has terminal cancer]: Amy, your results came back positive. You have cancer. …I know you are very important, and the world can’t get along without you, but it’s my job to let you know that it may be preparing to do exactly that, and it certainly will unless you begin immediate treatment. Do you understand? Prof Radisson: Do you think you are smarter than me, Wheaton? Do you think there is any argument you can make that I won’t have an answer for? … Now, I want to make this clear. In that classroom, there is a god, and yep, I’m him. I’m also a jealous god, so do not try to humiliate me in front of my students. …If you truly feel a need to continue with this charade, I will make it my personal mission to destroy any hope of a law degree in your future. Have a nice day. Martin: Can I ask you a question? Martin: Why are you doing what you are doing? [Martin says that everyone thinks he is crazy; his girlfriend has left him, his parents don’t want him to take this risk, and all the preparations are making it hard to do his other school work.] You have described your difficulties, but you haven’t answered my question of why. Josh: I don’t know. I just think of Jesus as my friend. Martin: So you think Jesus is God? Josh: Yeah; the Son of God. I don’t want to disappoint Him, even if everyone thinks I should. See, to me, He’s not dead. He’s alive. I don’t want anyone to get talked out of believing in Him just because some professor thinks they should. Mina: It’s like I’m a convenience to him, except for when my faith comes up, then he becomes verbally abusive. Pastor Dave: I’m guessing he’s bright. Handsome. And his attention makes you feel special; it gives you a sense of completeness. Psychologists call it the Cinderella complex… In essence, you are looking for his approval to give you a sense of self-worth instead of generating it internally. (Lots of people do it.) But using romance to shore-up self image is an unstable foundation. (If God is incapable of making mistakes…) and He made you in His image, His likeness, then it follows that He cares about you… to the point where God’s only son would willingly be crucified again for you, just you, if that’s what was necessary. Well, if He loves you that much, who cares what your boyfriend thinks? To the wrong person, you’ll never have any worth, but to the right person you’ll mean everything. 11. Josh: What happened to you? Prof: When a 12-year-old watches his mother dying of cancer, it’s only natural to beg God for her life. He’ll promise anything to his make-believe grandfather in the sky, including to love and worship him forever, if only he will spare her. 12. Mark (talking to his mother, who doesn’t even recognize him): You prayed and believed your whole life. Never done anything wrong. And here you are. You’re the nicest person I know. I am the meanest. You have dementia. My life is perfect. Explain that to me! Singer 1: Did we schedule this? Amy: No. I find that the best interviews are unscripted. So, in a few minutes you guys are going to go out there and you’re going to sing about God and Jesus as if they are as real as you and me. How can you do that? Michael Tait: Well, to us, they are as real. As a matter of fact, even more so. I mean, we exist in the here and now. They’ve existed forever. Think about that. Singer 2: Well, they may be ancient, but they’re not scribblings. I mean, we believe God gave us an instruction manual, and it’s where we draw our strength and where we find our hope. Duncan Phillips. So, where do you find your hope? Duncan Phillips: Hey Amy, you’re not here to trash us, are you? …I think you’re here, kind of hoping that this stuff is for real, aren’t you? Man: God says that a lot. Pastor: God gives us the answers we’d ask for if we knew what He knows. Are you willing to put your faith in Jesus Christ? God is willing to forgive you of all your sins [sins that have separated you from God], if you accept his Son and ask Jesus into your life as Lord and Savior.